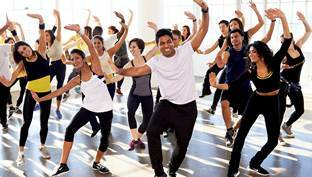 Let us teach your Corporate Executives how to dance Bollywood in the blink of an eye. Whether it’s incorporating your C-Suite Executives into an inspirational diversity act, helping your employees create an engaging performance for an upcoming holiday party, or even teaching your team “Jai Ho” as an icebreaker at your next conference, Ishaara’s Executive Engagement offerings are simply unparalleled. Add some flare to your next event by allowing your executives to “suit up” in flashy outfits and dance like Bollywood stars! 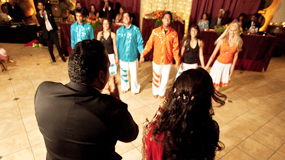 Also, don’t forget to ask us about our brand new Bollywood Excursions program! Need to reward your top performers at work? How about a Bollywood party! What makes for a cooler outing than learning some cool dance moves, rocking out to Bollywood music, getting decked out in vibrant attire, eating amazing Indian food, and expanding your horizons all in the span of a couple hours? Plus, the Ishaara team will take tons of pictures and record high-quality video so you (and your friends) don’t miss a minute of the action! Watch the CEO of Ishaara – Shahil Patel – lead a group of 15 Accenture professionals (none with prior Bollywood dance experience) in a fully choreographed performance…all done in under 8 hours of total practice time! Contact us today for more information about our Executive Engagement offering – you won’t regret it.